Ida Keeling is breaking records at age 95. 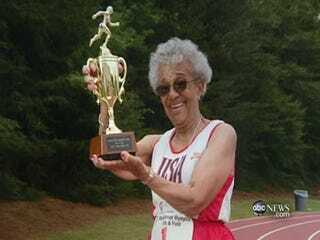 The Huffington Post is reporting that Ida Keeling is the world's fastest nonagenarian. The 95-year-old Bronx, N.Y., native set a world record at a track meet in northern Manhattan last week, running 60 meters in 29.86 seconds, according to ABC News. She's the oldest woman to do so. At 4-foot-6 and 83 pounds, Keeling says she has always been the oldest person at her meets. That might be because she didn't even take up the sport until she was 67. Keeling lost her husband to a heart attack at age 42 and two sons to drug-related deaths. Her daughter, Shelley, a lawyer, real estate investor and high school track coach, convinced her mother to take up running. Since then, Keeling has set record after record, becoming one of the world's oldest sprinting legends. We guess there are no more excuses for not working out or getting in shape. Ms. Keeling has proved that it can be done at any age. Way to turn tragedy into triumph! In other news: Aretha to Fantasia: Get Over Grammy Snub.